The warmth of a country house with a touch of elegance makes this home a standout in any neighborhood. Efficient use of space and well thought-out traffic patterns make this home impressive as well as functional. The elegance continues throughout the home to the screened porch with balustrade and adjoining deck. 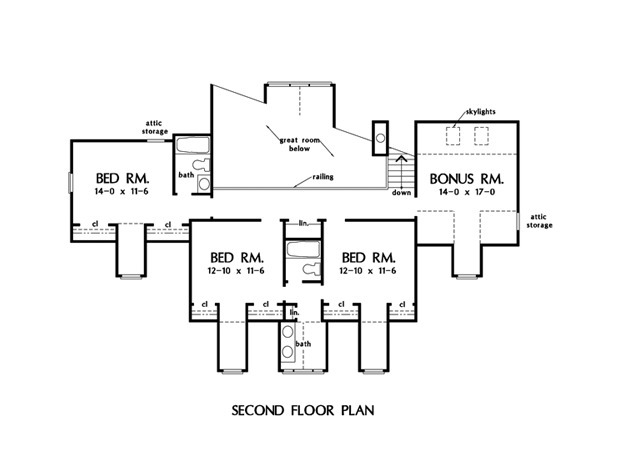 Special interior features include a balcony overlooking the vaulted great room, a flexible living room/study, a luxurious master suite, a handy food preparation island in the kitchen, a convenient first floor powder room, a bonus room accessible from the second floor, and extra storage space. 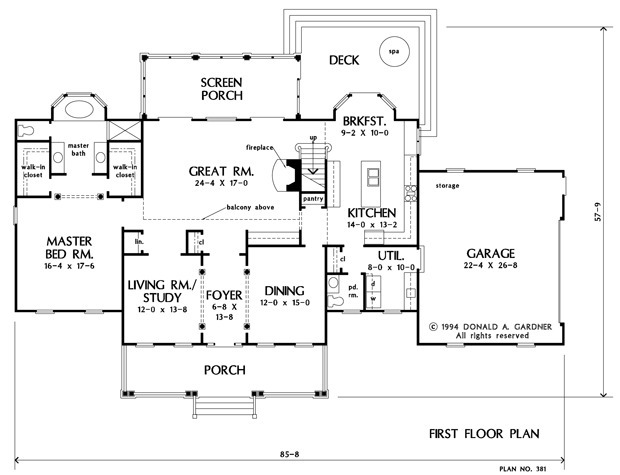 1st Floor: 2126 Sq. Ft.
2nd Floor: 1006 Sq. Ft.
Porch - Screened: 252 Sq. Ft.
House Dimensions: 85' 8" x 53' 6"
Great Room: 24' 4" x 17' 0"
Master Bedroom: 16' 4" x 17' 6"
Balcony : 28' 4" x 4' 5" x 8' 0"
Foyer : 6' 8" x 13' 8" x 9' 0"
Dining Room : 12' 0" x 15' 0" x 9' 0"
Great Room (Cathedral): 24' 4" x 17' 0" x 23' 2"
Kitchen : 14' 0" x 13' 2" x 9' 0"
Breakfast Room : 9' 2" x 10' 0" x 9' 0"
Utility Room : 8' 0" x 9' 10" x 9' 0"
Bonus Room : 14' 0" x 17' 0" x 9' 0"
Garage : 22' 4" x 26' 8" x 0' 0"
Master Bedroom : 16' 4" x 17' 6" x 9' 0"
Bedroom #2 : 14' 0" x 11' 6" x 8' 0"
Bedroom #3 : 12' 10" x 11' 6" x 8' 0"
Bedroom #4 : 12' 10" x 11' 6" x 8' 0"
Porch - Front : 32' 0" x 8' 1" x 0' 0"
Porch - Screen : 23' 8" x 9' 5" x 0' 0"
Living Room : 12' 0" x 13' 8" x 9' 0"